Yesterday, Mariposa Food Co-op held its much anticipated groundbreaking ceremony to kick-off the renovation of their new location on Baltimore Ave. We first made mention of the community-owned grocery’s big move in our January ‘11 issue. With 2.3 million dollars raised, 90 percent of the total expansion project’s budget, construction is set to begin. The ceremony and reception took place in the new location’s cavernous main room. Rows of chairs, a podium, various tables featuring member sign-up information, and food fresh from the co-op were set-up where aisles of local and organic food, cashier stations, and a community room will soon stand. As Mariposa board members and staff, plus representatives from local organizations who have supported the renovation (The Reinvestment Fund, Philadelphia Industrial Development Corporation, PA Dept. for Communtiy & Economic Development, Philadelphia Commerce Dept. ), and Mayor Nutter took to the podium it became clear that Mariposa’s big move is more about expanding community support than square feet. Each enthusiastically emphasized that the growth of the co-op will create jobs, increase access to healthy food, provide economic benefits to the city, and increase the commercial appeal of Baltimore Ave in a way that your typical grocery never could. During his presentation, Mayor Nutter dubbed the project “an absolute winner all around,” citing the project’s reuse of a vacant building, plans for a green roof, and ability to increase access to fresh fruits and vegetables – all important components of his Greenworks Philadelphia plan for expanding sustainability initiatives in Philadelphia. Following the mayor’s presentation, it was time for the big groundbreaking – which turned out to be a cake-breaking. 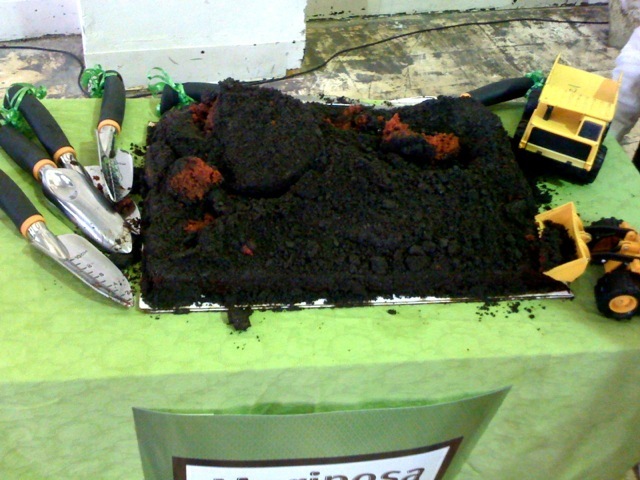 Members of Mariposa’s staff rolled out what appeared to be a mound of dirt on a large platter, but instead was a gummy worm-filled vegan and soy-free red velvet cake made from scratch by a Mariposa member using ingredients gathered at the co-op. After donning hard hats, Mariposa staff-members, Mayor Nutter, and organization representatives used small shovels to dig into the sweet treat and officially celebrate the final step in the project’s completion. Renovations will begin in two-weeks and hope is that they will be complete by early fall, when both non-members and members (who will receive an additional discount) will be invited to shop.